It was with great sadness that I learned of the death of organist Mike Carr. Mike, born in South Shields, was considered by many to be one of the world’s greatest jazz organists although, when I first encountered him he was playing piano and vibes with northeast band the Emcee Five. I spent quite a few heady evenings listening to the band at the old Down Beat Club in Newcastle. It was a stellar line-up with Mike’s brother Ian on trumpet and flugel, Gary Cox on tenor, Malcolm Cecil on bass and Ronnie Stephenson on drums. Playing mainly originals in a style based on the Jazz Messengers there have been few better bands to have emerged from the northeast than the Emcee Five – as, according to legend, some members of the Basie Band found out when they dropped by after a City Hall concert. After the band broke up, Mike switched to organ and, with drummer Tony Crombie, recorded Hammond Under Pressure; one of the very best jazz organ albums of the era and this was in an era when there was an organ trio on every block. Except this wasn’t a trio – you didn’t need a bass player when Mike was dancing on the pedals! He later did play in organ trios with Ronnie Scott – anyone remember that fantastic session at the County Hotel opposite Newcastle Central Station? In more recent years he formed the short-lived, but exciting, Mike Carr’s Blue Note Band. They played several numbers from the Emcee Five pad so the wheel had turned the full circle. Last I heard he was in ill-health and only playing occasional restaurant gigs. Oscar Peterson was quoted as saying that Mike Carr was one of the best Hammondists he’d heard – praise indeed but, if you belonged Tyneside we knew that already! Another segment of my youth has gone and with it, one of my idols. Mike Carr was 79. May he Rest In Peace, he will be sadly missed. PS: The music of Mike Carr and the Emcee Five is currently being kept alive by local band the Safe Sextet. 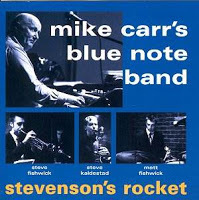 Mike Carr's Blue Note Band played a cracking gig at Newcastle's Corner House Hotel in 2003. If memory serves, the (then young) Fishwick twins were in the band. In their own way the Fishwicks have kept Carr's flame burning. Sad news, Lance. I saw Mike Carr backing Coleman Hawkins at the Connaught Hall in Blackett Street in 1967 when I was 14 - a seminal night in my life as a jazz musician, as you can imagine. He and Tony Crombie played the first set as an organ and drums duo, then Mike switched to piano to back Hawk, with Dave Green added on string bass. Almost 50 years ago now, but I still remember it clearly. A great musician. You and me both, Steve. I too remember the concert well. Hawkins looked very frail but blew almost nonstop even for piano and bass solos. It was in the early days of JNE and in what seemed a very short space of time we saw Earl Hines, Hawkins, Ben Webster, Ed Hall, Bill Coleman, Rex Stewart, Johnny Griffin and all at the Connaught... we didn't know how privileged we were! Mike was the swingingest piano player I ever had the honour and pleasure to play with when arrived aged 15/16 from Redcar and adn joined the King's College Modern Jazz group with his brother Ian. I was greatly saddened by the news of his passing. He will certainly not be forgotten. I got to know Mike in the 70's,and went to his gigs around Newcastle, Gosforth,etc, Alnwick jazz club with Ronnie Scott, I always ended up helping to carry the Hammond in and out of the venue but did not mind, He was without doubt my no 1 organist,and a nice guy So sad to hear this news. I remember sitting having a drink in the Gosforth hotel with Mike, Bobby, and Gary Cox who was standing in at short notice for Ronnie Scott,and they were trying to sort out a set list for the gig at Gosforth Civic hall they kept changing their minds, about what to play, but boy when they went on it was stunning! !, what a show!!. Very saddened to read of the death of Mike. Back in the 1950s I used to take a snare drum to his (parents) house on Gosforth high street for a"knock", It was there one evening that Ian arrived having just bought a trumpet ! RIP Mike one of the greats ! Very sad news. Yes Lance, I too (as a teenager!) was at that amazing gig at the County Hotel in 1973 or 74 - the Ronnie Scott Trio augmented by Gary Cox. I remember having a drink in the downstairs bar before the gig with North-East bass player Dave Murphy (can't remember whether he was playing in Ronnie's band or in the support group) and the amazing drummer, Bobby Gein. I remember Ronnie Scott introducing Bobby to the audience as "coming from South Africa, which is a very good place to come from!" I was also lucky to be at the gig in the Ashington jazz club, mentioned by Mal, above. I was driven there by my old friend and mentor, the late Nigel Stanger, following a Sunday lunchtime session with the Newcastle Big Band. And I recall another gig by the same trio, round the same time, at the University Theatre. They were obviously a very busy touring band in the 70s and Mike Carr's amazing playing made it all swing incredibly! There were few, if any, Hammond players who could swing like Mike and offer a completely natural musical experience without any attempts to be flash or clever. He felt the music as it was and played it from the heart. Both Oscar Peterson and Milt Jackson said that they thought he was "one of the best". Mikes ability on pedals was unsurpassed even by the likes of Jimmy Smith. In addition to the Hammond, Mike was one of the premier Vibes Players in jazz. Again a natural player who played with sensibility and feeling. He deserved much more recognition for his playing but his modesty meant he never really pushed it. He wrote an enormous number of compositions which he often ran by me singing the lyrics himself. He had a really good voice but never sang in public usually hiring vocalists to sing in his place. I feel, to this day, like so many of his great contemporaries, he deserved better recognition. Mike never lost his love for 'Tyneside' and his connections to so many of his early sidemen there, before coming south to further his career. Mike was generous to a tee, often much more than he should have been. Despite the difficulties of bringing up two youngsters on his own, they always came first before work, his bubbly happy personality came out. Mike often, quietly, played gigs without taking money when he felt the fee was too low for the other guys in the band. A really great, unsung musician, father and all round 'human being'.